Republicans remain the favorite to win Senate control in November but have been been unable to cement their lead heading into the final month, the new CBS News Battleground Tracker finds, with the Democrats are hanging in across a number of close races. Another factor is the very real possibility of a runoff in Louisiana, if no candidate reaches 50 percent. In these estimates neither incumbent Mary Landrieu nor Republican Bill Cassidy breaks the majority threshold with multiple candidates on the November ballot; Landrieu has a plurality in that test, but we also tested a runoff between her and Cassidy, and Cassidy leads that head to head. That translates into an eventual Republican edge to get the seat in our simulations, but the political reality is that there would be another campaign between now and then and would, at a minimum, forestall any GOP Senate celebration. A runoff, if it happens, would be held in December. Meanwhile, North Carolina has moved a bit toward the Democrats, though as last month, it remains effectively a toss up. Democratic Sen. Kay Hagan has a one point edge now in these estimates, and she was narrowly down last month. Hagan has sought to paint Republican Thom Tillis as too conservative for the state. In these results she - like many Democrats - enjoys a lead among women, among moderates, and among Amfican Americans - whose turnout will ultimately be critical for Hagan's chances - but the preponderance of likely voters who call themselves conservatives and going overwhelmingly for Tillis is among the factors keeping this close. 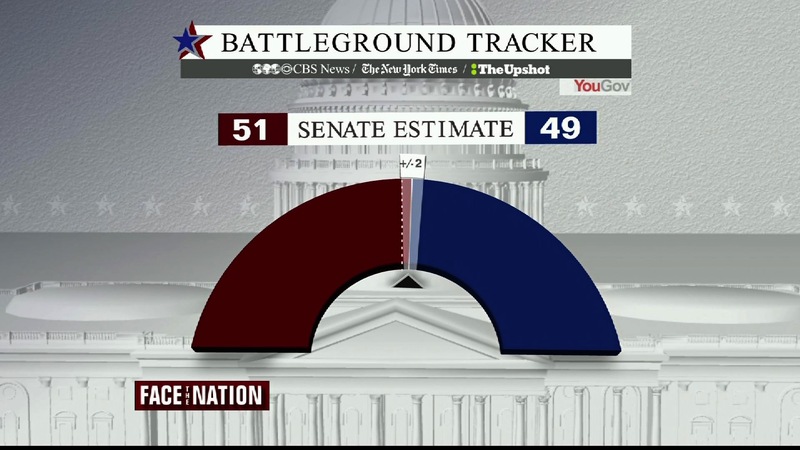 The Battleground Tracker estimates are done in all Senate races and based on interviews with more than 100,000 voters conducted online by YouGov exclusively for CBS News and the New York Times as part of this joint project. The map below shows the current leaders in the estimates. Two other states the Democrats all but have to hold, the open seat in Michigan and incumbent Mark Udall's in Colorado, are leaning their way. Michigan leans blue for the first time in our estimates for Gary Peters, and Mark Udall's small lead in Colorado appears to be holding for now. Republicans, meanwhile, are still eyeing a pickup in Arkansas, which has gotten a bit more Republican, and Dan Sullivan still has a lead in Alaska. Both Republicans were ahead in the last Tracker as well. In all, our full simulation of what would most likely happen if the election were held today still has the GOP taking the Senate at 51-49, but the simulation suggests that no one should be surprised if they got to 52 or 53 seats, nor is a Democratic hold outside a realistic chance. If Republicans get the pickups that loom at the moment in Alaska and Arkansas, they'd still need to win Iowa or break 50 percent in Louisiana to take the Senate, or else take North Carolina where they now trail. And another wrinkle: Alaska counts its votes late into the night on election night, or over the following days, so it's also possible we'll wait to know a winner for a while. Iowa is effectively tied. The estimates now give Democrat Bruce Braley a lead of under one point before rounding, well within any margin of error computation, and the race estimates are just decimal points apart, both with and without "leaners." New Hampshire at this point looks more comfortable for incumbent Democrat Jeanne Shaheen; she leads former Massachusetts Sen. Scott Brown by seven. In Georgia, David Perdue still leads Democrat Michelle Nunn, now by four points in an estimate that's gotten a bit tighter since last month. Nunn leads among moderates but still trails among seniors, whose support helps Perdue keep that lead. These results overall also give insight into just how hard it is to move the political needle. Although many voters remain undecided - as is often the case in midterms until the last few days - our re-interviews with Tracker panelists in the key battleground races showed that a state by state average of 91 percent of them did not change their candidate choice in the last month. Looking at the model as a simulation is a way of examining what's most likely to happen given the state-level results we see now, and having a number of paths to get to 51 is one factor that continues to tilt things in the GOP's favor. Plus, they have at least three seats (Montana, West Virginia and South Dakota) in which they are all but certain to get pickups, leaving them needing only three more seats to make it to 51, out of all the other races in play. But given the possibility of runoffs and the other uncertainties, there's a somewhat higher hurdle for them to win the Senate outright, at least on the night of Nov. 4. Data in the third wave of the New York Times/CBS News Battleground Tracker are based on online interviews with 105,277 voters conducted September 20-October 1, in all 50 states and 435 Congressional districts across the United States. YouGov, of Palo Alto, Ca., assembled the panel of registered voters, and conducted the selection, interviewing and tabulation. All 107,623 respondents in the first wave were recontacted and 53,723 were re-interviewed for this wave. In addition, 39,751 new panelists were added for the second wave. All panelists have previously opted-in to a YouGov or other online survey panel. In each state and district, respondents were selected to match the demographics of registered voters. In competitive House districts and the 15 smallest states with Senate elections this year, YouGov interviewed disproportionate numbers of voters to increase the sample size for these races.